an area larger than the South American continent. verdant and productive green oasis. Ethiopia, Sweden, Rwanda, Spain, Mongolia, Uganda, Australia and more. 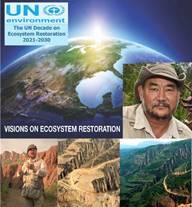 with ecosystem restoration, delivering a message of hope and inspiration. of losing the planet as a home by disrupting all its functioning systems. prepared to do, rehabilitate itself and flourish. California, where devasting wildfires took place last Fall. Barbara and Southern California area. to meet and converse with John D. Liu. tickets on sale at the Lobero Ticket office, 805.963.0761; Lobero.com.